If you are one of those people who can’t bear the thought of being chained to a desk and you have good hand-eye coordination, then getting qualified for forklift jobs with a forklift certification may be just what you are looking for. Operating a forklift, or powered industrial truck, is challenging physical work. You can leave your problems behind when you clock off and get to look forward to another new day on the job that is anything but monotonous. Forklift drivers are in high demand all throughout the country for a variety of work. 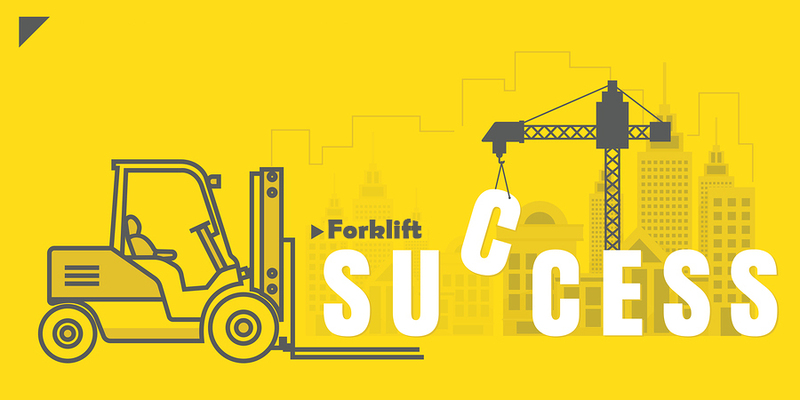 New construction, maintenance work, dock work, and even special events need the help of forklifts and their operators. What this means for you is that you’ll have your pick from the hundreds of new forklift jobs popping up everyday all around the US and you can start a new and exciting career in very little time. The money isn’t bad, either. The median national salary is $32,809. But only those with a forklift certification qualify for the highest paying jobs. Once you complete forklift training and receive your certificate, you can take it anywhere in America and beyond because the qualification is portable. If you like working outside with various objects and tools, and you’d prefer not to have a boss lurking over your shoulder all the time, you’ll love what you can do at forklift jobs. Moving and handling loads in a warehouse. Anything from cartons of toilet paper around a warehouse to placing delicate and valuable computer equipment (circa half a million dollars’ worth) use forklifts and properly trained operators. Dock work. If you hanker for the feel of a sea breeze but don’t have sea legs, then driving a forklift truck to load and unload ships in the marine sector might be for you. Building and maintenance work. Find a position working inside facilities and outside on construction sites for building and maintenance work. Special events. Work with different organizations and companies to help put together special events and set-up entertainment venues. The first step to qualifying for forklift jobs is completing forklift training and receiving your forklift certification. Hundreds of fatal forklift accidents happen every year in America and the majority of them are caused by operators performing unsafe acts, using improper practices, or who failed to recognize hazards. If you want to protect your life on the job, you need your forklift certification. Your safety while operating forklifts is the number one reason to get forklift training, but it’s just as important if you want to qualify for forklift jobs. Employers simply aren’t willing to hire untrained and uncertified workers to operate their machines due to the increased risk of accidents, equipment damage, penalties and fines from government agencies like OSHA. Employers look specifically for job applicants who have a forklift certification license because they know they’ll be able to help them create a safe, accident-free workplace. Every year, roughly 100 forklift operators lose their lives and another 20,000 are seriously injured. The main causes, as a result of operator error – forklift overturns, pedestrian struck by forklift, victim crushed by forklift and victim crushed by forklift – are all easily preventable with correct training. The industry has one of the worst track records for industrial accidents, so it’s imperative for you to complete a forklift certification with a reputable company. The Occupational Safety and Health Administration (OSHA) insists that forklift operators receive the necessary training so that more of these accidents can be prevented. In fact, to enforce these rules, employers can be fined up to $126, 749 for willful violations, like willfully hiring untrained workers! When you’re looking into forklift certification, don’t get just any program. Look for one that is compliant with all OSHA standards and regulations. This type of forklift certification tells everybody (potential forklift jobs, OSHA, co-workers) that you have been trained to OSHA standards. It can help keep you alive, keep OSHA happy and help your employer avoid costly OSHA fines for employing operators who have not been certified. We’ve designed our forklift training program at FLC to be as fast, convenient, and affordable as possible—all while delivering the important information you need to operate forklifts safely and be OSHA-compliant. It only takes about one hour to complete from any device with an internet connection! Once you’re all done, you can instantly print your forklift certificate card to qualify for forklift jobs! You can also save on all three of these program when you bundle with the Training Kit. If you’re an employer and would like to train your own experienced operators to train new employees, purchase the Train the Trainer course and never pay for a third-party training program again. Whether you are looking for your first job or pondering a career change, there are a lot of advantages to getting a forklift certification. The money is good, you can basically choose wherever you want to live and work, and it’s remarkably fast and easy to get your forklift certification. Complete your forklift certification today to qualify for forklift jobs tomorrow! For more information, contact us at ForkliftCertification.com!